Cincinnati Mine Machinery is a family-owned business serving several leading companies in the mining equipment industry. The company manufactures a variety of OEM and replacement components, with an emphasis on conveyor systems. Assemblies and parts produced by Cincinnati Mine are typically composed of 40 to 50 Hrc heat-treated steel to endure harsh mining environments. With rising demand for coal in the energy market, Cincinnati Mine realized capacity limitations in its stand-alone horizontal machining centers. Consistency of part quality had also become a bottleneck due to machine performance and a high level of manual intervention. The company took action quickly to research new machine technologies that could improve production capacity, throughput and part quality. Cincinnati Mine investigated options available through several leading machine tool suppliers and selected a Makino Machining Complex (MMC2) pallet handling system with 24 pallets and two a71 horizontal machining centers. 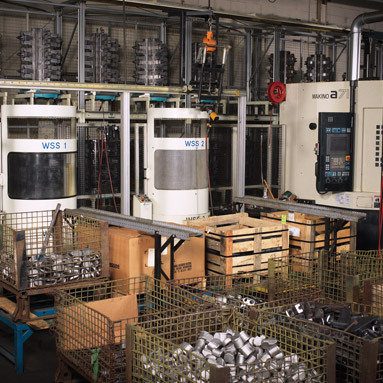 The company was impressed by the demonstrated production capabilities of this automated machining system and found Makino’s engineering services and local area support to be advantageous in taking on a new type of production environment. Cincinnati Mine witnessed a three-week turnaround for initial production runs at Makino’s Mason, Ohio, facility. The complete automated machining system was fully installed on the company’s shop floor in under three months. Cincinnati Mine immediately took advantage of the cell’s MAS-A5 control system by using its flexible benefits to create a kanban system with on-the-fly changeovers. This approach has enabled Cincinnati Mine to reduce its batch-size requirements and easily alternate between various orders in just 30 seconds. The productivity of the cell has increased Cincinnati Mine’s monthly output to 20,000 parts with a 70 percent decrease in cycle times compared to previous processes. By reducing operational variability, implementing custom mechanical fixtures, and adding part and tool verification technologies, the company has also experienced significant improvements in part quality, consistency and an overall 30 percent decrease in tool expenditure.